A biochemistry journal has pulled a paper after deciding that its layout and content overlapped significantly with a previously published paper. The researcher who reported the similarity to Molecular and Cellular Biochemistry has sent us his correspondence with the journal. After a “thorough investigation,” the journal felt the paper was worth retracting. The Editor-in-Chief retracts this article as per the Committee on Publication Ethics (COPE) guidelines on plagiarism. 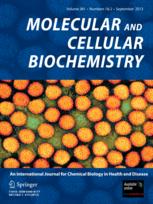 After a thorough investigation, it was found that there is a striking level of similarity in the layout and content of this paper with another publication (Tumor Biology (2013) 34:231–239; doi:10.1007/s13277-012-0543-8). It is also pointed out that the authors have failed to respond to these similarity issues, first brought to their attention in 2015. The 2013 paper has been cited 12 times, according to Thomson Reuters Web of Science. The 2012 paper it allegedly overlaps with, “Effect of TRAF6 on the biological behavior of human lung adenocarcinoma cell,” has gained nine citations times since publication. While reading these two manuscripts, we were quite surprised by the striking level of similarity in the layout and content of the two publications, given the fact that they do not seem to share a single common author. In a lot of aspects these two papers look just like carbon copies, but focus on the role of TRAF6 gene in two different biological settings. More disturbingly, we noticed what seems to be a duplicated and manipulated figure panel that is used in both publications. In Zhong et al. this actin normalization panel can be found in Fig. 6a of the manuscript, while in Peng et al. it can be found rotated 1800 in Fig. 7I (see below). We base our conclusion of image manipulation solely on the visual appearance of the two panels and cannot exclude a possibility that our assumptions are unfounded. We’ve reached out to the editor-in-chiefs of Molecular and Cellular Biochemistry and Tumour Biology — Naranjan S. Dhalla, a cardiologist at St. Boniface Hospital in Winnipeg, Canada and Torgny Stigbrand, professor emeritus at Umeå University in Sweden, respectively. We’ve also contacted the corresponding author Zhang Peng, who is based at Xinxiang Medical University in Henan, China. We’ll update the post with anything else we learn.